Copia A, by Trexel Animation, takes an audience into the wonderful world of animation and graphics with a twist. With no dialogue and a delightful soundtrack, this short displays a powerful message about passion and frustration. Copia A (3D animated short film by Trexel Animation) from Trexel Animation on Vimeo. 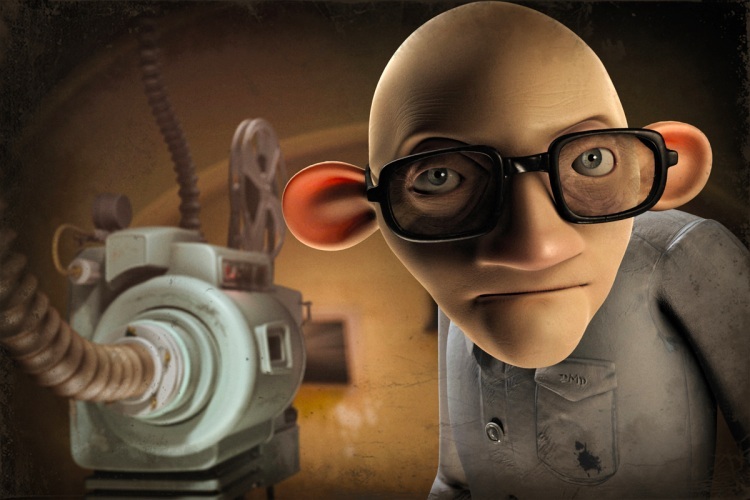 The story begins with an old man, completing his every day job of being a projectionist. Right away, the viewer can tell he is someone who is extremely involved with what he does and somewhat of a perfectionist. Piles upon piles of film reels set the scene in a tiny back room, while the main and only character tries to do his job as efficiently as possible. Coming across a familiar but dusted over reel, he puts it in the projector and discovers it has several problems. Getting himself wrapped up in trying to resolve its issues, the man finds himself in a whirlwind of chaos. Unfortunately, he gets so frustrated trying to fix the reel that he becomes trapped inside the a film reel himself. Brilliantly, the simple but upbeat soundtrack moves elegantly with all of the turmoil that this projectionist gets himself into. The message conveyed is a nice reminder of the “you can’t always get what you want” philosophy without suffering some major consequences.